On Saturday, May 9, I was fortunate enough to attend a Freezepop concert. This did not happen in any particular big city. It happened, of all places, in little old Wilmington! 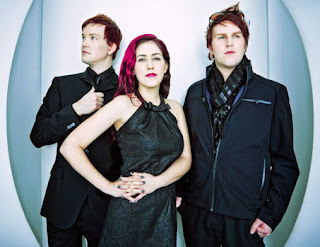 A few months ago in the early spring, I was rather surprised to learn that Freezepop was coming this way. I know they are used to playing for much larger audiences, and have not actually performed in North Carolina at all. So that must have taken some convincing on the part of the event organizers for The New Deal. Part hand-made goods and art market, part fashion show and concert, and all fund-raiser for Wilmington's own Dreams charity and art education center, The New Deal was conceived and coordinated by the good folks at the trendy Edge of Urge boutique. It brought together artists, designers, crafts-people, and musicians of all kinds for a common cause, and I think it was a great success. I hope it will continue to be an annual event, as the next time is bound to be even bigger. From my experience organizing Aniwave, that's just the way it works. After the hand-made market and the fashion show, Freezepop took to the stage to deliver an incredible performance. Finally a band that I could get truly excited about in this town! Now I may be biased, but this was one of the best shows to come to Wilmington yet. My only regret is that more people didn't come out to support them. I am happy to say that Freezepop delivered as well on the stage as they do on their recordings. Liz did a great job on vocals, and the dueling keytars of Duke and Seth burned through the night. Many people I know where nowhere to be found by the time the concert started, and they really missed out. I can only hope that Freezepop will come this way again, though I realize that it's not likely. Either way, thanks for an awesome time Freezepop!